As a very recent paper in Frontiers in Physiology rightly point out, “it becomes more challenging to induce further neuromuscular […], as training experience increases adaptation” (Walker. 2016). When you are hitting a plateau, the only promising option, according to the authors is to seek “alternative training methods in order to further increase strength and muscle mass” (ibid.). One of the classic methods to do just that is to utilize accentuated eccentric loading, i.e. to apply a greater external load during the eccentric phase of the lift as compared to the concentric phase (e.g. doing concentration curls with a supra-maximal weight, using the free arm to lift the weight up and only the working arm to slowly lower it, afterwards). followed a traditional concentric-eccentric isoinertial training program (TRAD). TRAD and AEL engaged in two 5-week training periods where training was performed twice a week (Monday and Thursday or Tuesday and Friday, to allow at least 48 h recovery between training sessions). Training consisted of three sets of 6-RM (session 1) and 10-RM (session 2) bilateral leg press and unilateral knee extension and flexion exercises. […] TRAD performed the exercises with the same load for both concentric and eccentric phases, while AEL performed the exercises with 40% greater load during the eccentric phase compared to the concentric phase (i.e. eccentric load = concentric load + 40%) […] In order for each training session to include a true RM, both TRAD and AEL used loads that elicited concentric failure in at least 1 out of 3 sets with the investigator assisting the subject to complete the set. Figure 2: Illustration of how weight-releasers were used to add add. load on eccentrics (Walker. 2016). Custom weight-releasers were used to add the additional eccentric load to the leg press exercise (Figure 1, left) while weight plates were manually added and removed by the training supervisor(s) with the use of a custom-built pin for the knee extension exercise (Figure 1, right). Both groups performed the concentric and eccentric phases of the lift with a 2:2 s tempo (i.e. 4 s in total), which was monitored by the investigator” (Walker. 2016). Immediately after each training session TRAD and AEL subjects were given a standardized recovery drink containing 23 g of whey protein (8.47 g leucine and 5.08 g isoleucine per 100 g), 3 g of carbohydrate and 1.6 g of fat (Total+, Vital Strength, PowerFoods International Pty Ltd, Marrickville, New South Wales, Australia) to maximize the initial protein synthesis response to training and standardize post-exercise nutrition between groups. Figure 2: Overview of changes in performance markers (absolute, left; rel. right | Walker. 2016). In spite of the identical nutrition and supplementation regimen and the highly similar workout protocols, the maximum isometric torque of the subjects in the AEL group increased significantly more in the accentuated eccentric load group than control (18±10% vs. 1±5%, p<0.01) over whole 10 week study – this benefit was accompanied by, or maybe even facilitated by an increase in voluntary activation (3.5±5%, p<0.05) the scientists analyzed by the means of EMG electrodes. Figure 3: Changes in volunatary activation level (%) in the three study groups (Walker. 2016). The study also shows that the eccentric (AEL) regimen lead to sign. increases of the isokinetic eccentric torque (10±9%, p<0.05), while the TRAD group saw only increases concentric torque – increases that were albeit smaller (9±6%; p<0.01 vs. 10±9%; p<0.01; difference 1±7%; p<0.05) than those of the AEL group. And even the knee extension repetition-to-failure improved in the accentuated eccentric load group only (28%, p<0.05). Against that background it is a bit surprising that the authors found “similar increases in muscle mass occurred in both intervention groups” (Walker. 2016). 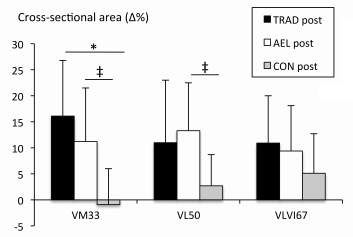 While there was no difference between the size gains in the TRAD and AEL groups, meaning that eccentric training did not promote muscle gains, both forms of training were vastly superior to the subjects’ individual routines (CON). Bottom line: “In summary, accentuated eccentric load training led to greater increases in maximum force production, work capacity and muscle activation, but not muscle hypertrophy, in strength-trained individuals” (Walker. 2016). Walker, Simon, et al. “Greater strength gains after training with accentuated eccentric than traditional isoinertial loading loads in already strength-trained men.” Frontiers in Physiology 7 (2016): 149.